The German Shorthaired Pointer is a clean-cut, lean, well-balanced, hunting dog with an elegantly chiseled head. The muzzle is long, but never pointed. The length of the muzzle should be the same as the length of the skull. Unlike the English Pointer, the occipital bone is not very conspicuous nor is there a pronounced stop. The almond-shaped eyes and nose are brown. The eyes have an intelligent, good-humored expression. A large nose is preferred. The larger the better. The broad ears are set high and lie close to the head. The teeth should form a scissors bite. The coat on a German Shorthaired Pointer is rough on the hand, short, thick, and flat. On the ears and head, the hair is softer. Hair may be longer under the tail and the back edges of the haunches The short, dense, sleek coat should be solid liver or liver & white, patched, ticked or roan. 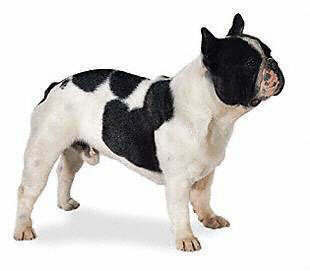 A dense undercoat protected by the stiff body hair makes the dog water resistant and better adaptable to cold weather. The skin should be tight. The tail is customarily docked by 60% (the dog should be able to sit on his tail), and the dewclaws removed. The feet are webbed. The German Shorthaired Pointer is a little smaller than the standard Pointer. A versatile and good natured dog, the German Shorthaired Pointer is an active and agile dog, and is tolerant, obedient, and intelligent. The German Shorthaired Pointer is quick to learn, and this can make training far easier, although some may have a stubborn or dominant streak that make them best suited to owner with some experience of dog ownership. 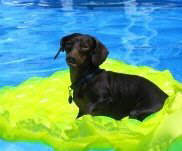 Others may be overly submissive, and in order to ensure a well balance temperament early socialization in important. These are dogs that have plenty of energy and love to play. 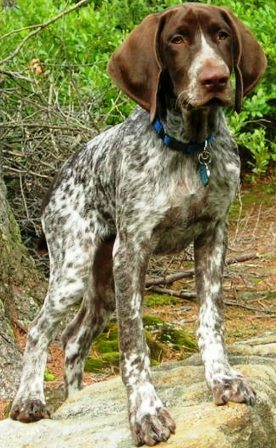 The German Shorthaired Pointer get along well with children, although his size can prove a problem if you have very small children, as they could inadvertently knock them over. They also tend to get along okay with other pets when well socialized, although some may chase cats and they can be aggressive with strange dogs. 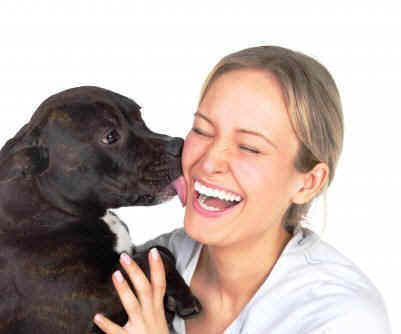 Their reaction around strangers can vary between friendly and reserved depending on the personality of the individual dog. This is a focused, dedicated, and protective breed, and can make a good watchdog. 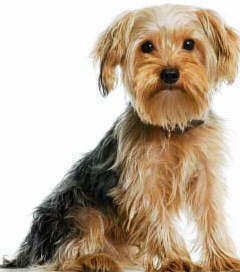 These are dogs that are well suited to family life, and are ideal for active people with confidence and assertiveness. The German Shorthaired Pointer is extremely easy to groom. They must be brushed regularly with a stiff bristle brush. It is important to check this breed's feet after exercising and working. They must be dried thoroughly after strenuous activity to keep them from becoming chilled. This breed is an average shedder. Because the German Shorthair is a hunting dog, they naturally have a lot of energy to burn and can be tireless. They need to be with an active family that can provide lots of outdoor activities, preferably off lead. 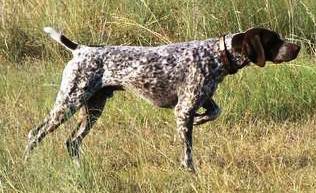 The German Shorthaired Pointer are tireless and full of energy. Vigorous exercise is extremely important. If they are not given an appropriate amount of exercise and stimulation they become restless and destructive. They are a good family pet for the active family. This breed needs a lot of space and room to run. They must have a fenced yard.